Historian David Bebbington gave the first plenary session at Baylor University’s conference, Secularization and Revival. He took a topic about which I knew nothing – the intellectual tradition of Primitive Methodists in the northeast of England – in Weardale, a valley of leadminers in County Durham – and made it come alive. A competent historian can present whichever stories are most intriguing from his research to make a captivating talk. When faced with an audience unfamiliar with the topic, it takes real skill to deal with substantive questions of history AND include all the great stories. That’s what David Bebbington did this evening. Bebbington began with the assumptions most contemporary historians would make about the Weardale Primitive Methodist leadminers – based largely on E.P. Thompson‘s classic The Making of the English Working Class. Their involvement in the heavily emotional religion, and participation in the many revivals and awakenings in the region, would mark them as non-intellectual, men in whom reason was overpowered by the desire for supernatural experiences. In fact, he said, most historians would hold that Primitive Methodism was incompatible with any particularly lively intellectual life. Then he went about dismantling that view. He described the style of worship of the Primitive Methodists – an emphasis on instant conversion, repentance with tears, people shouting out their praise of God, much singing – and some of the people who were leaders or primary supporters of the Primitive Methodists. At first, it seemed that he was making E.P. Thompson’s case. Then Bebbington began to describe the subscription library in Weardale. Hundreds of the miners were subscribers; the records from the Victorian era show that its thousands of volumes circulated widely. While works of theology were a central element, so were books of science, philosophy, history, and the works of the enlightenment. The works of Kant and Hegel were represented; local preachers and lay people wrote about them in various Methodist journals of the time. According to Bebbington, a nationwide inquiry showed Weardale to have the highest level of literacy found anywhere – 97% for men, 90% for women. It was also one of the areas where Primitive Methodism was the strongest – and the movement’s leaders were among the biggest patrons of the subscription library. One even moved his home into the library after his wife died. Bebbington described the intellectual lives of three Weardale residents in detail – a lay person and two of the preachers. They were men of strong intellect – reading and grappling with fine points of philosophy, willing to follow where the logic of their study took them. All had been strongly influenced by the Enlightenment. All came to believe that, in fact, the Enlightenment, with its emphasis on reason as the only way of knowing, actually cut people off from other sources of knowledge. Their sermons, journal articles, and letters include strong statements of the necessity of using both faith and reason to reach the highest levels of knowledge and understanding. After being captivated by the stories, we found that Bebbington had made his case. The leaders of this sect that prized a high degree of emotionalism were, in fact, some of the best-read men in the country – and so were the members of their congregation. Rather than faith driving out reason, the case of Weardale seems to be one of reason leading to a greater faith. In walking through the parallel growth of Primitive Methodism and a thriving intellectual community in Weardale, we were left to confront another issue. E.P. Thompson, a member of the English Communist Party, had strong anti-religious opinions – and it was his groundbreaking history of the working class which put into place this notion that fervent religion and intellectual vitality could not occur together. 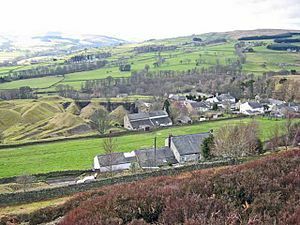 Although the story of one valley in the north of England does not, of itself, demolish the theory, it does provide another example of the impact of ideology on the analysis of data. If you have a chance to hear Dr. Bebbington speak, or read any of his books, it will be worth your while to seize the opportunity.